This just shows you how dumb I am when it comes to baking. Pondering the next move in my baking appreciation classes, I thought it would be so cool to have the kids make one of the cookies my grandmother made for Christmas every year. Everyone in our family has vivid memories of “gram” arriving at the house with a carload of tins filled with her special cookies, all meticulously crafted and layered in their antique tins between perfectly round pieces of wax paper. One of the standouts as far as I was concerned turned out to be gram’s butter chews. I remembered them as having dates. But that, I learned was a different cookie. I had to call my mother for the recipe and soon set off for the store in search of non-hydrogenated shortening. That should have been my first clue. What kind of “butter chew” calls for shortening and no butter? I arrived back home with an $8 tub of “organic” shortening made from “mechanically pressed palm oil.” Not very satisfying, I must admit. I turned to my wife for a bit of advice on the first set of instructions in the recipe, which called for “mixing” 1 1/2 cups of shortening with 3 tablespoons of sugar and 1 cup of flour. “What do you mean, ‘mix’?” my wife asked. I thought the instructions were pretty straightforward. How many different ways can you “mix,” after all? But in baking, there is no such thing as a simple mix. Was I supposed to “cream” the butter and sugar first, then add the flour? Gram’s instructions, I soon learned, were hopelessly vague. Talking to one of my sisters, my wife further learned that gram was also a stealth baker. She wouldn’t let anyone see exactly how she made her cookies. Had she really taken the secret of her delectable butter chews to her grave? My wife sent me upstairs to perform a Google search for butter chews. I protested. How bloody likely was it that gram’s butter chews would turn up on the internet? Was I in for a surprise. I hit the “enter” key and dozens of butter chew recipes rolled across my screen. 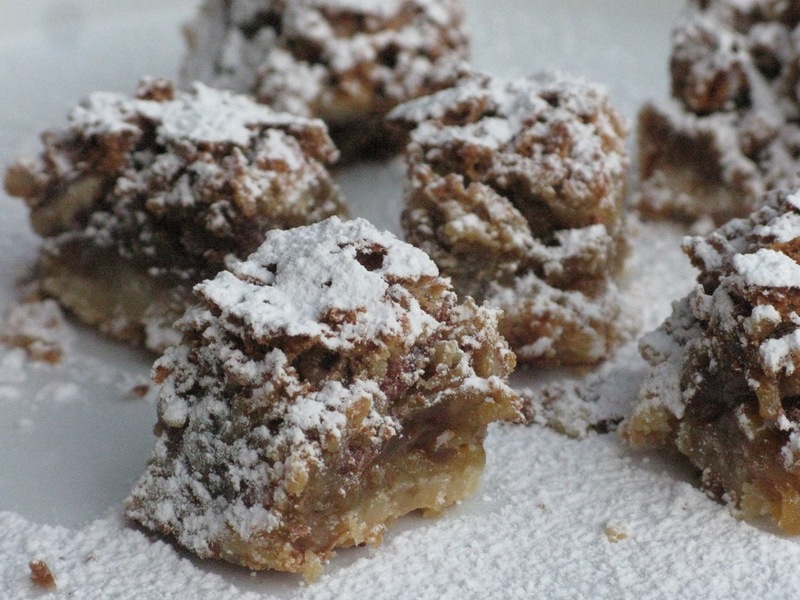 They were all very much like gram’s–lots of brown sugar, egg whites and coconut. Except these called for actual butter, and they actually explained how the cookies were supposed to be made. I won’t give away the ending here. You’ll just have to come back on Friday, after I’ve had a chance to make the cookies with my classes, to learn the formula for these drop-dead delicious butter chews. All I can say for now is, Thanks, gram, for the inspiration. But I’ve got my own butter chew recipe now. I love this! LOL! I had a Grandmother that used to give out wrong recipes with incorrect measurments. We believe it was so that no one could make them as good as she did! I eliminated shortening from my kitchen about 10 years ago (gross!) Ever since I have made every pie crust and cookie with pure butter. I can now taste when the store bought cookies are made with shortening or real butter. I am glad that you went through the effort of investigating this, and I’ll be back Friday to see what you did. Those things look awesome.